Place du Cap at night. Place du Cap dans la soirée. That is a stunning shot! Very nice job! Well Jilly tis one is simply stunning. You know, it reminds to our friend Richard style. 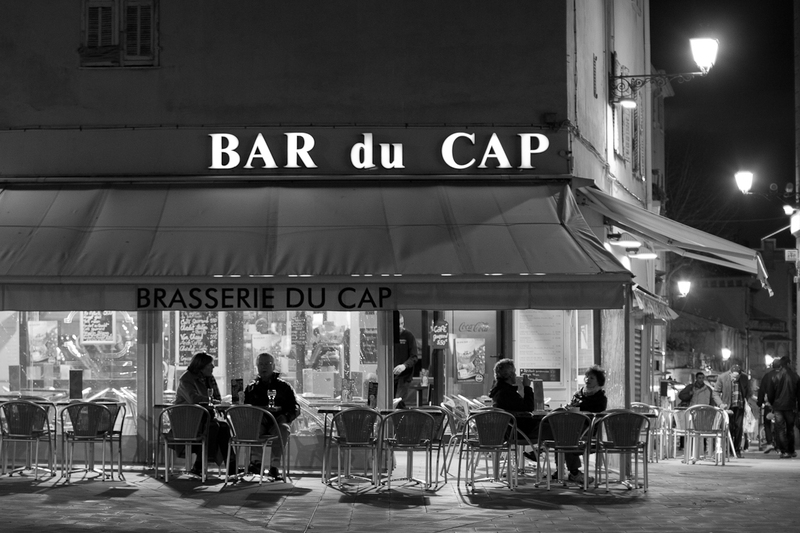 Then, let me say that the B&W applied to a night shot taken to a French bistrot / bar is definitely superb ! I wish I could understand French as it looks like something it isn't. I guess it is just a bar. Though I do like the use of black and white. Black and white always leaves the entire picture up to your personal imagination to fill in the colors. Many thanks for kind words, Nikon and Fabrizio. Abe, it's just a bar and a brasserie, nothing more, nothing less. Very forties-looking shot. And I like the pun, 'nightcap'. An outstanding image, Jilly! No words needed. Beautiful photo. You could have called it "Nighthawks," like the painting. love the composition of this night shot.